Great Cocktail Recipes: Christmas Cocktails: Yo HO HO and some Bottles of Rum and Punch! Christmas Cocktails: Yo HO HO and some Bottles of Rum and Punch! Hey, everyone! I happen to get lucky today and get some really great rum. I had some Rum Punch which you could see in the back made with Bacardi Gold. 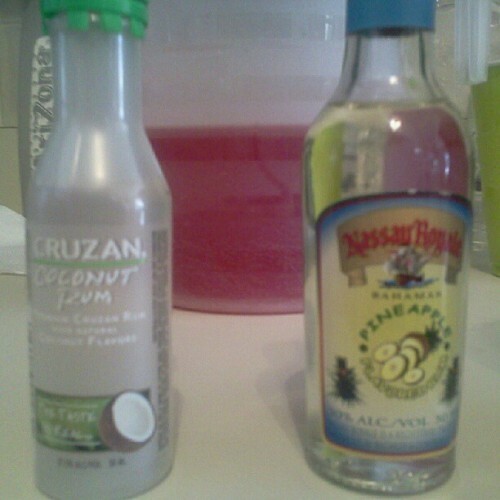 Then I had got some Rum from my country (Bahamas) looking at the Pineapple flavored Rum and some St. Croix (Cruzan) Rum, the coconut flavored. It's going to be a rather soothing Christmas. I'm going to watch Django in a little bit. Might go at that Cruzan in like 40 mins..hahaha. Peace!